2016 PGA Championship at Baltusrol Golf Club: Is Rickie Ready? SPRINGFIELD, NJ—The evolution of a touring golf professional is fairly straightforward. First, demonstrate the capacity you belong: consistently making cuts is a major step. Then graduate to the level in showing the wherewithal to contend in regular events. Being able to win a tour event is the next hurdle. The final two steps are the hardest. Compete in a major event and if totally successful add your name to the roster of elite players who can say they have earned a major championship. Rickie Fowler has clearly shown all of the element mentioned above—save for one. Winning a major event is the ultimate prize for the 27-year-old. In 2014, Fowler added his name to a select grouping of golfers who finished 5th or better in each of the calendar’s major events—something only Jack Nicklaus and Tiger Woods had done at that time. Jordan Spieth joined the group with his outstanding play in 2015. The main difference between Fowler and the others mentioned is just one small but critical detail—he’s yet to win a major event. Fowler had a solid follow-up year to his play in 2014. He won the prestigious Players Championship—with multiple birdies on the infamous water-surrounded par-3 17th. Rickie also showed a global capacity to win in claiming The Scottish Open with a solid effort to adjust to problematic weather conditions overseas. Rickie concluded the year with a victory in the Fed-Ex Cup Playoffs—winning the Deutsche Bank event by one stroke over Henrik Stenson. The main issue is that Fowler has simply been unable to show anything close to the level of play he demonstrated in all of the ’14 majors. Over the last seven majors since then, he’s missed the cut three times—back-to-back at Augusta and Oakmont this year. Finishing in a tie for 46th at The Open earlier this month at Royal Troon was a bit better but hardly noteworthy. Rickie reached his highest ranking of 4th in the world thus far when winning earlier this year the Abu Dhabi HSBC Golf Championship. A few weeks after that Fowler looked to add the Waste Management tour event to his portfolio of successes but poor decisions and faulty executions when needed allowed Japan’s Hideki Matsuyama to win. Fowler has parlayed his looks and boyish charm to big-time endorsements and his affable demeanor has made him a clear fan favorite. But there’s no monkey as big or weighty as the one in which all golfers carry and are ultimately judged—major wins. The PGA Championship at Baltusrol is the final major for ’16. 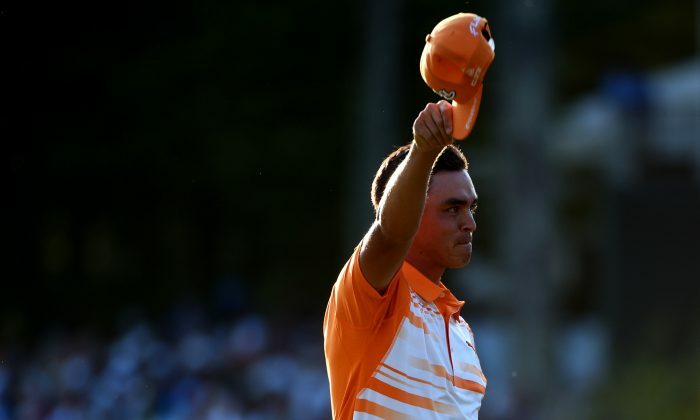 Rickie has not had a top ten finish in a major since the PGA Championship at Vahalla nearly two years ago. Being in the conversation come weekend at a major event is something Fowler realizes needs to happen. The issue for Rickie is can he successfully avoid the bad swings that have caused him to fall off the radar screen. Before his breakout season in ’14 Fowler’s name surfaced—along with Ian Poulter—as being rated by his fellow peers on the PGA Tour as one of the most overrated golfers on the circuit. Fowler clearly has shown that contention to be in error but golf, like all other sports, is based on the never-ending storyline of what have you done for me lately? Winning a major is the ultimate separator between the aspiring players and those seated at the front of the line. This year three players earned their first major. Danny Willett did so at Augusta and then Dustin Johnson and Henrik Stenson did so respectively at the U.S. Open and The Open Championships. Rickie is planning to compete in the forthcoming Summer Olympics in Rio de Janeiro as part of Team USA in early August and is a lock to be part of this year’s Ryder Cup team matches in Minnesota in late September. But no matter if Rickie should capture a Gold Medal the ultimate distinction for professional golfers comes with the four key events played annually. Fowler is the highest rated player in the world at #7 without a major. He is joined in the top ten by Spain’s Sergio Garcia who has been searching for his first major since 1999 when he burst upon the scene as a 19-year-old phenom and nearly claimed the PGA Championship title at Medinah, ultimately losing to Tiger Woods by one stroke. Much was predicted for Garcia and he has clearly parlayed his talents to a fine career. The main missing element—a major championship win. The thing about major championships is that they are extremely hard to win. Any golfer needs to have his game at a certain level and be able to deal with the infinitely higher amount of pressure that comes with competing in them. The physical element is important but the mental toughness to lock oneself away from all the outside commotions is no less central to coming out on top. Jack Nicklaus used to say winning majors was easier than other tour events because he believed that so many players had convinced themselves in not being able to go the distance. But the era of professional golf now is deeper than ever before—even Nicklaus has said as much. A major win for Fowler would clearly elevate his overall profile and add him to the mix with other stars of comparable agessuch as Rory McIlroy, Spieth and Jason Day. Forcing the issue simply does not work. The first step for Rickie is being able to get off to a good start this Thursday at Baltusrol. His play in majors this year has clearly shown a step back from what he did so well in ’14. Nonetheless, the clock is ticking. The longer one goes without winning a major the more focus one puts on the matter. Majors are important numbers for any golf career. They are the ultimate barometer in separating competitors from one another. No one is more aware of this than Fowler. M. James Ward, a member of Golf Writer’s Association of America (GWAA) and past member of Met Golf Writer’s Association (MGWA), has reported on golf’s grandest events since 1980 in a variety of forums.